The Maltese National Canine Federation was established in 1999. Its aim was to embrace local clubs with true canine interests. The idea to form a Federation of Canine Clubs came out in 1997, but it was during the Annual General Meeting of the Malta Canine Society of the previous year that Mr.Victor Mercieca, then President of the Malta Canine Society, came up with the idea to form a Federation of Canine Clubs. This idea was taken very seriously by all present. At that time canine matters were dictated by the Malta Kennel Club. Certain events and behavior that where emerging at that time from that club was annoying members of all clubs and the need to have a Federation ruled by representatives from all the clubs was indeed becoming in need. Proposed changes to the Malta Kennel Club Statute by its Committee in 1997 brought harsh reactions from its entire existing affiliated Clubs, as these changes, if approved, would have brought the affiliated Clubs and their democratic running in danger. These proposed changes were shelved for the time being. This brought everyone to their senses and the need for the formation of a Federation which would deal with all governing issues was identified as a very important issue for the existence of these Clubs, and more importantly, for a more democratic way in the governing of Canine matters in Malta. Talks started in 1999 between the Malta Canine Society, The German Shepherd Dog Association and the Obedience & Agility Association and later the Maltese Ladies Kennel Association. The Malta Kennel Club was also invited to participate but this invitation was turned down. In May 1999, without their member's knowledge or approval, the MKC joined the Federation Cynologique Internationale (FCI). Subsequently, the MKC called an Extraordinary General Meeting to approve their affiliation to the FCI. The meeting was held in Valletta, in July 1999, on a Monday evening. Long-standing members were held at the door to have their membership checked. Other persons, who had never been seen before at any dog shows or other canine activities, were led into the hall by certain MKC Committee members without any verification to their membership status, they weren't even asked their names! This group of people, which amounted to over one hundred "non active members" as they were later referred to, attended the meeting and cast their vote of approval to the affiliation to the FCI and to the decision that the MKC would not join any local Federation. It was clear that the majority of these "non-active members" were not understating what was happening, did not even have any interest of what was going on or what they were voting for. They just did what they were told. It was obvious that the MKC Committee intended to have their way with or without their members' consent. 39 out of the 60 genuine members attending that meeting walked out of the meeting in protest. No wonder many refer to this event as the BLACK MONDAY in Maltese canine history. It was a terrible event that shook the local dog scene. It made everyone more aware how important it was to have a Federation administered by representatives of affiliated Clubs. The MKC debates this by saying that the Malta Canine Society had tried to undermine their process of affiliation to the FCI and that the Malta Canine Society officials had secretly met the FCI officials and tried to seek affiliation too. This is an untrue and misleading statement as the truth is that during a meeting between the British Kennel Club and the FCI during Crufts Dog Show in 1999, Malta was mentioned by the FCI as an applicant for membership with the FCI. Kennel Club officials asked from which Club in Malta this application came, and the FCI officials were surprised to hear of two Clubs because they were never informed of any existence of other Clubs in Malta. To verify this, an FCI official met with officials of the Malta Canine Society who were also attending that same show, to clear this matter. The Malta Canine Society did not ask for affiliation during that meeting or after as maliciously stated by the MKC, but just answered questions made by the FCI Secretary, about the existence of other Clubs on the Island. The FCI secretary said that he would refer this matter to Mr.Madsen, who had met the MKC in Malta and was in charge of discussions with them. Mr. Madsen phoned an MCS official a week later to hear for himself what was happening in the dog scene in Malta, as it was obvious that he was misinformed and was very surprised to hear of another 3 clubs on the Island, one of them being in existence for over 25 years. Mr. Madsen was invited to re-visit Malta as a guest of the Malta Canine Society, to have this matter explained to him in person, in the presence of the MKC Committee, to prove to him that what was being stated during that telephone conversation was the truth. Mr. Madsen promised he would contact again the MCS before confirming the MKC membership. For some strange reason, he never did. After the events of July 1999, it was decided by the Clubs forming the Federation to speed up the process. The GSD Association was the first to terminate its affiliation to the MKC. In September 1999, the Federation held its first AGM and the first Council was elected. Magistrate Dr.Carol Peralta was elected as President. Mr. Joe Bonett was elected Secretary. In October 1999, The Malta Canine Society held an Extraordinary General Meeting where the members unanimously voted for the termination of the affiliation to the MKC and in favor to affiliating to the Federation. By this time another Club had been founded - The Maltese Ladies Kennel Association. As the name suggests, it is an Association administered solely by females. It organizes General Championship Shows. The MLKA is also a founder member of the Federation. In November 1999, The MKC issued a circular to its members in which they stated that since the clubs affiliated to the Federation were no longer recognized by them, any of its members participating in any show organized by any of these clubs will be suspended. The first show after that circular was that of the Malta Canine Society in the same month, November, had a record entry, and strangely, no one was suspended, as this would have left the MKC without any members, let alone those "non-active" ones. This was clearly a vote of confidence to the Federation and a major blow to the MKC. To save face, the MKC later stated that suspension was only meant for its Committee members participating in other Clubs' shows. Also in November 1999, the British Kennel Club recognized the Maltese National Canine Federation and Reciprocal Agreements were reached between the two bodies. This infuriated the MKC as they always expected that the Kennel Club would recognize only them. They even state that this goes against the spirit of fair play! The MKC has since tried to terminate the agreement between the KC and the Federation. 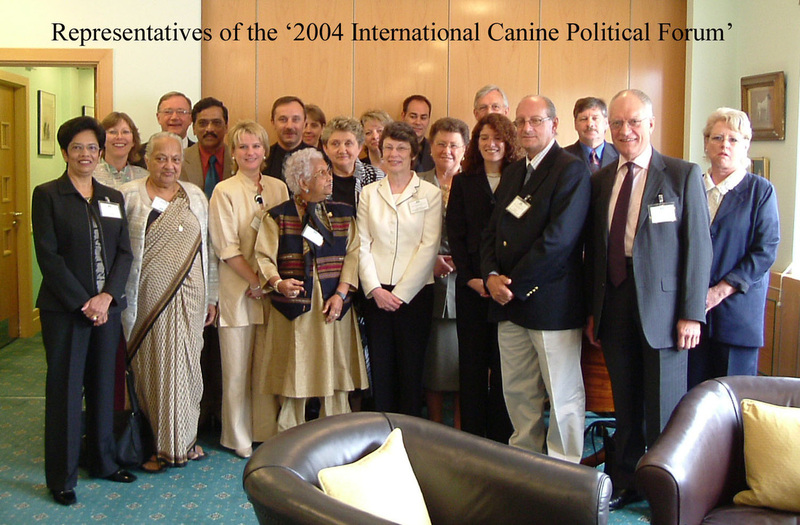 In June 2001, the Federation was represented by its Secretary, Mr. Joe Bonett, and by its International Secretary, Mr. Frank Borg, at the Conference for Commonwealth Kennel Clubs organized by the British Kennel Club in London. Numerous topics of interest were discussed by the representatives of the Countries present. In February 2002, Mr. Frank Borg became the first Maltese to become a member of the British Kennel Club. The MNCF also took part in the next two Conferences for Commonwealth Kennel Clubs which took place in London in 2004, 2008 & 2009. 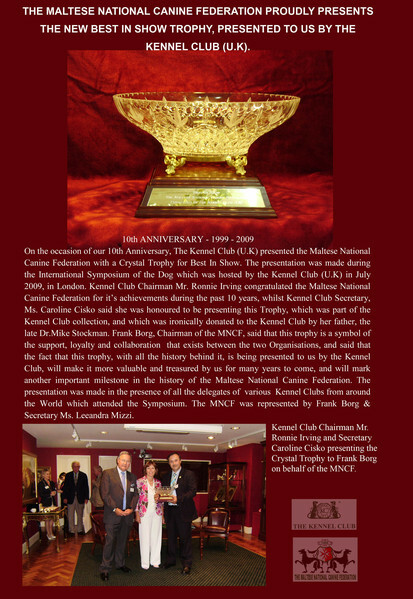 In 2009, during the International Symposium of the Dog, hosted by the Kennel Club in London, Frank Borg on behalf of the MNCF was presented by a beautiful crystal trophy by the Kennel Club on the occasion of our 10th Anniversary. The Federation's Council changes according to the changes in the committees of the affiliated clubs, as the Council is formed by committee members selected from the affiliated clubs. Frank Borg was elected Chairman of the Federation, a position he still holds to this day.